Washington - At a time when the U.S. Department of Housing and Urban Development (HUD) is threatening to impose restrictions on access to Community Development Block Grant for Disaster Recovery program (CDBG-DR) funds, Puerto Rico Housing Secretary Fernando Gil Enseñat, yesterday, supported that Congress passes a bill to have permanent structures and regulations for these funds. 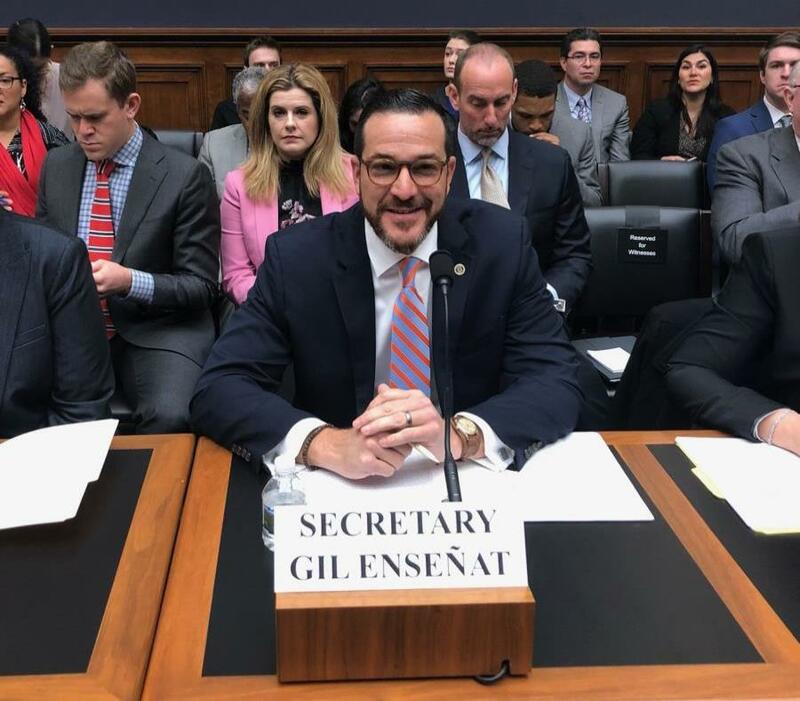 "We want that what is good for New York or Florida, will also be good for Puerto Rico," Gil Enseñat said moments after testifying before the U.S. House Subcommittee on Oversight and Investigations of the House Committee on Financial Services. The subcommittee is evaluating the proposal to regulate the CDBG-DR program, specifically created by Congress to respond to natural disasters, but does not have a permanent structure at HUD. After the devastation caused by Hurricane María, which caused more than $100 billion in losses and nearly 3,000 deaths, the federal government committed to grant Puerto Rico $20 billion in CDBG-DR funds, which are essential for the reconstruction process. However, only $1.5 billion were authorized from that package and $42,000 were formally delivered. When authorizing the action plan for the next $8.221 billion, HUD Secretary Ben Carson announced on February 28 that the money would be delivered with additional financial controls "given the Island’s history of financial malfeasance” that he attributes to the island's government. "We haven't seen the restrictions to be put in place. There were informal conversations about restrictions in the flow of funds. When the first $1.5 billion were released, there were no restrictions imposed, only to certify that there were 'x' or 'y' personnel by December (2018)," Gil Enseñat told El Nuevo Día after the hearing. The subcommittee’s session, chaired by Democrat Al Green (Texas), was intended to hear opinions on CDBG-DR program , including Secretary Gil Enseñat and counsel to the HUD's Office of Inspector General (OIG) Jeremy Kirkland, regarding a draft bill proposing to make the CDBG-DR structure permanent. The bill also seeks to guarantee access to funds for municipalities that have resources, a claim made by the island's mayors. A report from the Government Accountability Office (GAO) recognized this week the need for the CDBG-DR program to have permanent rules. The same was stated in a memorandum from HUD's OIG. "Without permanent statutory authority and regulations such as those that govern other disaster assistance programs, CDBG-DR appropriations require HUD to customize grant requirements for each disaster in Federal Register notices—a time-consuming process that has delayed the disbursement of funds," the GAO said. However, the report noted that HUD had staff limitations to implement the CDBG-DR program. "HUD determined that the 2017 CDBG-DR grants posed high risk due to the size of the grants, but did not have a comprehensive plan to monitor these grants," the GAO added. According to HUD's OIG legal counsel, FEMA has 24 officials overseeing the distribution of $54 billion in CDBG-DR funds, while nearly 750 are working on that department's budget of nearly $40 billion. Secretary Gil Enseñat indicated that because it is periodically legislated under different governments, the CDBG-DR program can be at the mercy of the preferences of the political leadership of the moment. As for Puerto Rico, Gil Enseñat said the requirements have included "multiple federal registry notifications" and at least three action plans. Gil Enseñat maintained a cordial tone toward HUD, but noted that due to leadership changes in that federal office, programs approved in July 2018 were reversed in March 2019. In addition, Secretary Gil Enseñat said that he imagined additional funds would help HUD build internal capacity and provide better oversight over CDBG-DR funds. However, Gil Enseñat advocated for flexibility in the program and not allowing the equal distribution of funds to only rely on data provided by the Federal Emergency Management Agency (FEMA) and the Small Business Administration (SBA). "We recommend that governments (receiving CDBG-DR grants) determine appropriate recovery models based on locally collected information and taking into account real needs," Gil Enseñat said. At the end of the hearing, Congressman Green, who was in Puerto Rico three weeks ago as part of a delegation led by Homeland Security Committee Chairman Bennie Thompson, said he is well aware of the passions generated over the slow and inefficient federal response to Hurricane María. "We want to do everything we can to help," Green said.